Devoted to designing a portable with high performance power inverter gained the highest average review rating. Keep your laptop, phone, tablet or other devices charged and running all day. One AC outlet and two USB ports with up to 3.1A output. This product is for DC12V and Car ONLY, not applied for DC 24V and airplane use. For charging your iPad, please use the 2.1A USB port and keep the other USB port free. It’s normal for the inverter to become warm to the touch while you are using it, avoid placing the inverter in direct sunlight or next to heat-sensitive materials. Since the inverter has a fuse that trip over a certain voltage, using a small one to run equipment that requires a lot of power, will not work. Don’t use it to charge high power electric devices such as hair dryer, straightener or curling iron, electric heaters, which might blew a fuse. Good to Know: with 18 Months Warranty and Provide Friendly, Easy-to-Reach Support. 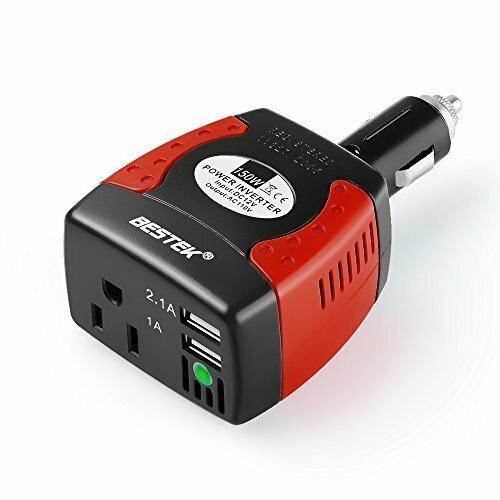 Tagged 110V, 150W, 4.2A, Adapter, BESTEK®, Dual, Inverter, Power. Bookmark the permalink.